World Snooker has appointed creative agency, Earnie to deliver a new ticket sales campaign for The Dafabet Masters, one of the major flagship events of the snooker calendar. As part of World Snooker’s drive to reach younger audiences and deliver more content-led communications, Earnie has created a new campaign identity. 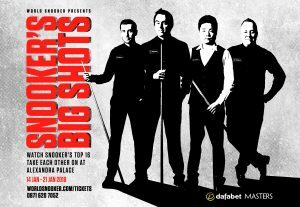 Working with the theme ‘Big Shots’, Earnie will deliver a number of digital, video and event assets to highlight the competitive nature of the event, which features the top sixteen players in the world playing at Alexandra Palace.